Most of the owners of solar panels never thought that after buying and installing them they will ever need to perform any kind of maintenance. The most common misconception of all about solar panels maintenance is that solar panels cleaning on a regular basis is not needed. The reason that many people think that cleaning of solar panels is not a necessity stems from the belief that rain will clean them so mother nature takes care of our renewable energy investment. Unfortunately this is not true! Why should we clean our solar panels? Rain does not clean solar panels completely. Just to give you a very simple example think of your car’s windshield. Is a dusty windshield spotless after a good rainfall? Most probably not since we all use our wipers just to get that extra level of cleanliness to increase visibility to the point we won’t get into an accident. In addition, even if rain does clean solar panels to a certain point, depending on the area where you are situated precipitation is not on a demand basis so it might be a long period of time for your panels to wait to be rinsed from rain. Furthermore, certain areas are affected by dust storms or have significantly higher levels of dust in the air that rain alone will not do the trick for you. 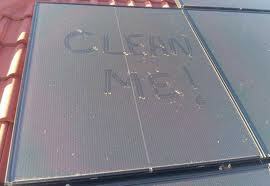 In addition to dust, solar panels are victims of bird droppings which are a lot harder to be removed with just rain. But why should you be concerned about dust and bird excrements on solar panels? The reason is quite simple bird excrements and dust that accumulate on the surface of your solar panels reduce the energy production causing you to lose money from your investment. What are the exact effects from not cleaning my solar panels? According to the US Department of Energy studies it’s been indicated that dust by itself can decrease your panel efficiency rate by almost a 7%. Adding into the equation bird excrements, leaves, rainfall water spotting this can go up to a 25%. Translating this into years of payback it is estimated to 3 to 5 additional years. What are my solar panels’ cleaning options? Your first option is the DIY where you get to clean your solar panels; but first of all let’s stress the following obvious. Solar panels are usually on your rooftop which can be a dangerous place if you are not cautious and have not taken all proper safety measures. Thus you ought to be very careful in order to avoid any injury! Having said that, If you are going to clean your solar panels on your own then you should do it either early in the morning when the sun is not very hot or in the afternoon after the sun sets. The reason is that during the hours the sun is burning if you throw cold water on your panels then you might end up cracking them. Moreover, this is time you want your panels to produce electricity uninterruptedly so if you are going to be cleaning them regularly you are going to hinder your production. Another point you need to be careful is not just to turn the hose on since this way you are causing water spotting that will result into reverse polarity that will decrease your production level instead of increasing it. So what you should use? You should use a soft cloth and a soft (preferably biodegradable) non abrasive soap. Once you wash it you should use another cloth that is dry to remove any soapy water that is left that can cause water spotting. Another option is to call a professional cleaning crew to do the work for you that of course comes at a cost. Finally there also automated systems ranging from sprinklers to robots but in case of residential systems which are relatively small you have to do some math if the cost is worth it. Solar panels are a great investment where you get to help the planet’s environment while you benefit financially at the same time. Like any other investment though you need to take care of it and make sure that their performance is at an optimal level. The starting point of protecting your solar panels investment is by cleaning them on a regular basis which as we described is not something hard. So take the time to perform a visual inspection to determine whether you should clean them or not depending on your area weather conditions.